The following is a useful list of website links for customs and trade matters. We will endeavour to ensure that the links are current and we intend to add to the list over time. A very useful research tool for exporters with basic export market profiles for different industries and other introductory information and services for exporters. Contains basic information for importers and exporters and current notices. Contains a very good summary of international trade issues and copies of cases can be obtained from the site. This is an extremely popular Australian legal website that contains current reported Australian cases in major jurisdictions together with major pieces of legislation. 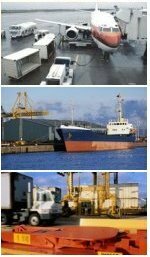 This is the major representative body for Australian Customs Brokers and Freight Forwarders and contains very good up to date information on customs matters. Some of the site can only be accessed by members. Australian Federation of International Forwarders. The Australian Federation of International Forwarders was created in July 1996 following the merger of two distinct organisations, namely: The Australian Federation of Airfreight Forwarders. Victorian Employers' Chamber of Commerce and Industry. The Victorian Employers' Chamber of Commerce and Industry (VECCI) is Victoria's most influential employer group. VECCI was started by the business community to represent business. Fantastic site hosted by the University of Oslo, Norway, which contains information about pertinent international trade law issues. Copyright �2007 by Gross & Becroft lawyers . All rights reserved.